Fimmvörduhals-Eyjafjallajökull-Eruption SD Version from Marc Szeglat on Vimeo. It is Day 5 or 6 of ashmageddon here in London. The skies have been one of those deep, blue Montana skies with a slightly peachy hue to the sunsets. Similar to those I remember after Mt St Helens. A recent weather report here says that the ash cloud is approaching Newfoundland, so our problem may also become yours (N. America). Now, the UK government is deploying warships to bring Britons back to the UK from the European continent. More than 750,000 Britons are stranded in Europe and 250,000 in other parts of the world. There is talk now of Britons stuck in North America being flown to Spain and then bussed to the UK (a 30 hour trip by bus). In the meantime, I have seen a new wrinkle in this issue as the climate change lobby is pushing hard on the benefits of having a contrail-free airspace -- not sure they will win this one. I have to admit, it is strange to feel like we wound back the clock 50 years, one in which a low-flying propeller plane grabs your attention. In the meantime, tons of African fruit, British fish and other foodstuffs are rotting in Kenya and at Heathrow. The bigger cost downstream of this crisis is the financial one which will be added to the long tail of the stinger of the financial crisis. As for now we are concerned about fish that stay in the rivers thoughout the winter. 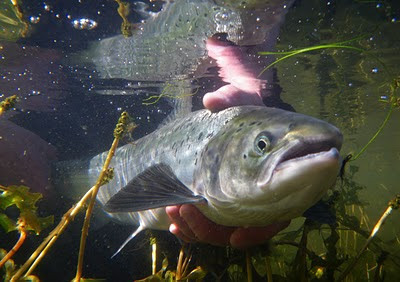 The salmon run does not start until June and the arctic char run is a little later. The sea trout run has started but this is not the spawning run. Nobody knows for sure what impact the eruption will have on river or ocean conditions. It depends on wind direction and the chemical nature of the ash. When the same volcano erupted about 100 years ago, it's ashes contained relatively high levels of fluoride, which was reported to have damaging effects on livestock. I do not know how it it will effect rivers in Southeast of Iceland where the ash has fallen so far. I'm pretty sure that this is not good for the rivers and that it will hurt the ecosystem, at least in the short term...but we need to hope for the best!